In the 1980s, a young adventurer and collector for a government library, Abdel Kader Haidara, journeyed across the Sahara Desert and along the Niger River, tracking down and salvaging tens of thousands of ancient Islamic and secular manuscripts that were crumbling in the trunks of desert shepherds. His goal: to preserve this crucial part of the world's patrimony in a gorgeous library. But then Al Qaeda showed up at the door. Haidara, a mild-mannered archivist from the legendary city of Timbuktu, became one of the world's greatest smugglers by saving the texts from sure destruction. With bravery and patience, Haidara organized a dangerous operation to sneak all 350,000 volumes out of the city to the safety of southern Mali. His heroic heist is a reminder that ordinary citizens often do the most to protect the beauty of their culture. His story is one of a man who, through extreme circumstances, discovered his higher calling and was changed forever by it. News coverage is often described as the "first draft of history." From the publication in 1690 of the first American newspaper, Publick Occurrences, to the latest tweet, news has been disseminated to inform its audience about what is going on in the world. But the preservation of news content has had its technological, legal, and organizational challenges. Over the centuries, as new means of finding, producing, and distributing news were developed, the methods used to ensure future generations' access changed, and new challenges for news content preservation arose. 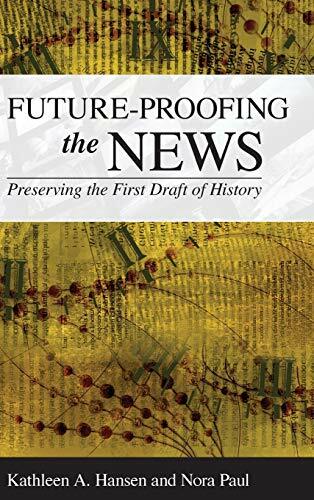 This book covers the history of news preservation (or lack thereof), the decisions that helped ensure (or doom) its preservation, and the unique preservation issues that each new form of media brought. All but one copy of Publick Occurrences were destroyed by decree. The wood-pulp based newsprint used for later newspapers crumbled to dust. Early microfilm disintegrates to acid and decades of microfilmed newspapers have already dissolved in their storage drawers. Early radio and television newscasts were rarely captured and when they were, the technological formats for accessing the tapes are long superseded. Sounds and images stored on audio and videotapes fade and become unreadable. The early years of web publication by news organizations were lost by changes in publishing platforms and a false security that everything on the Internet lives forever. In 50 or 100 years, what will we be able to retrieve from today's news output? How will we tell the story of this time and place? Will we have better access to news produced in 1816 than news produced in 2016? These are some of the questions Future-Proofing the News aims to answer. This lively, nuanced history of New York City's early public libraries traces their evolution within the political, social, and cultural worlds that supported them. Reading Publics examines how books and reading helped construct social identities and how print functioned within and across groups, including but not limited to socioeconomic classes. The author offers an accessible while scholarly exploration of how republican and liberal values, shifting understandingsof "public" and "private," and the debate over fiction influenced the development and character of New York City's public libraries in the eighteenth and nineteenth centuries. In 2014, author and photographer Kyle Cassidy published a photo essay on Slate.com called "This is What A Librarian Looks Like," a montage of portraits and a tribute to librarians. Since then, Cassidy has made it his mission to remind us of how essential librarians and libraries are to our communities. His subjects are men and women of all ages, backgrounds, and personal style-from pink hair and leather jackets to button-downs and blazers. In short, not necessarily what one thinks a librarian looks like. The nearly 220 librarians photographed also share their personal thoughts on what it means to be a librarian. This is What A Librarian Looks Like also includes original essay by some of our most beloved writers, journalists, and commentators including Neil Gaiman, George R.R. Martin, Nancy Pearl, Cory Doctorow, Paula Poundstone, Amanda Palmer, Peter Sagal, Jeff VanderMeer, John Scalzi, Sara Farizan, Amy Dickinson, and others. Cassidy also profiles a handful of especially influential librarians and libraries. There are a wealth of resources out there geared towards serving the needs of toddlers, school age children, young adults, and senior citizens. But something's missing. Library users in their 20s and 30s constitute one of the most underserved populations for public libraries, and there's a scarcity of guidance on how to target them. Barbakoff's fun and practical programming book helps to fill that gap. A 2013 Library Journal Mover & Shaker who was also named one of Flavorwire's "10 of the Coolest Librarians Alive," she shows how to draw emerging adults to the library using a mixture of play and engagement and then keep them coming back for more. Packed with ideas that are real-world tested and approved, this guide examines the unique needs and expectations of millennials, many of whom are already avid readers and have the potential to become a core part of the public library user base. By taking the initiative to offer programming that appeals to emerging adults, public libraries help to make them life-long library users. It's an investment that will reap benefits for years to come, and this book shows how to make it happen. Want to keep the momentum going after a successful teen event? That "one off" can easily be turned into a popular monthly club that will keep young adults coming back. Alessio, co-author of the bestsellers A Year of Programs for Teens and A Year of Programs for Teens 2, and Booth, co-editor of The Whole Library Handbook: Teen Services, show you how. Designed to be used in school or public library settings, this uniquely themed program guide Offers guidance on how to handle summer, winter and year-round reading programs, with activities ranging from easy to elaborate Provides activities useful for libraries with monthly teen clubs as well as those who want to plan occasional fun events Saves planning time and offers maximum flexibility by cross-referencing programs by themes, allowing one program to be used with different audiences Includes resource lists, readlikes, tips for success, and lessons learned from programs that went awry Whether you're a teen program novice or simply want to make your existing programming more effective, the club programs presented here will make teens excited to return to your library week after week. The all-in-one resource you’ve been clamoring for, this book presents a comprehensive package of literacy-based public library programming ideas designed for children in kindergarten through the early tweens. Chock full of strategies and best practices for promoting literacy and reading skill development, it also features numerous planning templates and other materials ready to print and adapt as needed. When a public library invests in building relationships with business owners, professionals, and job seekers in the community, it is investing in the livelihood, well-being, and future of all of its citizens. By demonstrating how the library is a valuable resource for these patrons, the embedded business librarian can be an equal partner in the business community and have an equal voice. As a business liaison librarian, Alvarez has taught nearly 150 job seekers, completed over 100 one-on-one appointments with business owners and professionals, and co-produced numerous videos and podcasts with entrepreneurs. Here she distills her experiences into a comprehensive, step-by-step guide to developing sustainable library-business relationships. 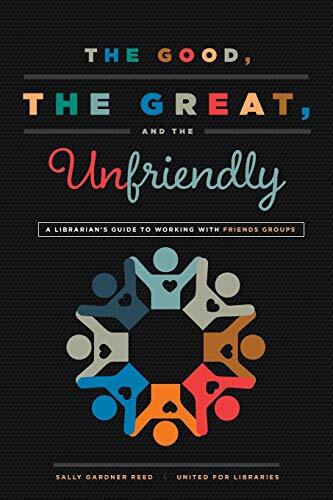 Tailored specifically to librarians' point of view, this book will inform and empower libraries to work effectively with Friends groups for greater fundraising, engagement, and advocacy outcomes. From hosting authors to planning and coordinating book activities such as book signings and book clubs, libraries are perfect venues for readers to interact directly with authors and their books. And mounting literary programming can be easier than you might think. In this guide Booklist's Brad Hooper inspires, encourages, and advises librarians in providing a wide range of programming that targets their communities of book lovers. Incorporating interviews from librarians in the field who share insider tips, this resource includes step-by-step guidance adaptable to any type of audience, from children and teens to millennials and older adults; shows how to plan author readings, coordinate book signings, and put together and moderate an author panel; offers marketing and outreach pointers, including interviewing authors for local radio, library podcasts, or webinars; lays out the nuts-and-bolts of organizing and hosting book clubs, with suggestions for facilitating book group discussions; presents ideas for creating displays of "staff favorites" and other ways to get staff involved and engaged; and explores programs for community-wide book events, such as "One Book, One City." Using this guide, libraries can connect book lovers eager to learn about recent and noteworthy books to authors and fellow book lovers. There are plenty of resources about teen services that focus on YA readers' advisory and programming ideas. But the basics of day-to-day service to teens in the library setting, a discipline requiring specific skills, is all too often glossed over in professional literature. As a result many LIS grads begin serving teens armed with an incomplete understanding of why their job is both important and unique, and what they need to know from day one. This compromises their effectiveness as both young adult librarians and advocates for teen services. In this down-to-earth book, former Library Journal Mover & Shaker Velasquez explores real-world challenges and obstacles to teen service that often present themselves, offering solutions and guidance for both new YA librarians and those wanting to freshen up their approach. Presenting fresh ways of thinking about the role of the teen services librarian and how it fits into the organizational structure, Velasquez Combines field-tested approaches with current research to tackle common teen library service issues such as truancy, curfews, programming philosophy and mission, privacy, and organizational resistance, whether subtle or overt Addresses each topic from the perspective of working with teens, family members, fellow colleagues, and community stakeholders Presents realistic strategies to help shift a library's culture towards one that embraces teens and teen services Shows how to get the most out of a library's teen space, discussing factors like location, age restrictions, time of day restrictions, and staffing, plus suggestions for using the shelf-space of the YA collection as a starting point This book goes beyond the "what" and "how" of teen services to get to the "why," ensuring that both new and experienced practitioners will understand the ways teens want to use public space, discover and create information, and interact with peers and adults. It is imperative that library programs reflect the rich diversity of the entire community. That includes Spanish-speaking children, who need opportunities to hear their home and school languages spoken, and to see their lives validated through engaging cuentos (stories) that reflect their cultural experiences. Additionally, when combined with other forms of targeted outreach, offering bilingual storytimes in English and Spanish is an effective strategy to attract Latino and Spanish-speaking families to your library. This all-in-one resource, written by two experienced specialists who understand the nuances of library services, collections, and outreach to this population, shows you how. Suitable for libraries just getting started as well as those with programs already in place, this guide discusses the importance of bilingual programming in the lives of Latino and Spanish-speaking children, addressing the unique educational and informational needs of bilingual children; provides 18 ready-to-use program plans for bilingual storytimes, suitable even for storytime leaders who don't speak Spanish. Library makerspaces continue to thrive, drawing new patrons in and engaging them as never before. This hands-on sourcebook edited by technology expert Kroski includes everything libraries need to know about the major topics, tools, and technologies relevant to makerspaces today. With the recent passage of the Every Student Succeeds Act (ESSA), school libraries are poised for a potential turnaround. But there’s only one way forward: school librarians must become leaders, fully interwoven into the fabric of the educational community. And to become a truly effective leader you’ve got to have a plan. In her new book, Weisburg builds on her decades of experience and mentorship in school libraries to offer a carefully crafted roadmap that guides readers step by step through the process of transforming into a leader, from becoming aware of what’s at stake to learning and mastering the necessary skills for leadership. Nearly 30% of all public school children attend school in large or mid-size cities, totaling more than 16 million students in 22,000 schools. For schools serving culturally and linguistically diverse populations and large numbers of children living in poverty, a significant achievement gap persists. Proponents of multicultural education often advocate for instruction with culturally relevant texts to promote inclusion, compassion, and understanding of our increasingly diverse society. Less discussion has focused on the significant body of research that suggests that culturally relevant texts have important effects on language and literacy development. By "connecting the dots" of existing research, More Mirrors in the Classroom raises awareness about the critical role that urban children's literature can play in helping children learn to read and write. In addition, it provides practical step-by-step advice for increasing the cultural relevance of school curricula in order to accelerate literacy learning. Instilling a love of reading in a child pays dividends long after early literacy skills have been mastered. The key to successful programming is to make children become participants, encouraging a "literary ear" and love of the beauty of language itself. To help children develop artful language patterns, correct grammar, and a large and rich vocabulary, Wadham offers a range of complete programs for children ages 5-12 that introduce literature in a systematic way. Intended for use by both librarians and students in LIS programs, Academic Librarianship Today is the most current, comprehensive overview of the field available today. Key features include: -Each chapter was commissioned specifically for this new book, and the authors are highly regarded academic librarians or library school faculty-- or both -Cutting-edge topics such as open access, copyright, digital curation and preservation, emerging technologies, new roles for academic librarians, cooperative collection development and resource sharing, and patron-driven acquisitions are explored in depth -Each chapter ends with thought-provoking questions for discussion and carefully constructed assignments that faculty can assign or adapt for their courses The book begins with Gilman's introduction, an overview that briefly synthesizes the contents of the contributors' chapters by highlighting major themes. The main part of the book is organized into three parts: The Academic Library Landscape Today, Academic Librarians and Services Today, and Changing Priorities, New Directions. Once treated as exclusive spaces for valuable but hidden and under-utilized material, over the past few decades special collections departments have been transformed by increased digitization and educational outreach efforts into unique and highly visible major institutional assets. What libraries must now contemplate is how to continue this momentum by articulating and implementing a dynamic strategic vision for their special collections. Drawing on the expertise of a world-class array of librarians, university faculty, book dealers, collectors, and donors, this collected volume surveys the emerging requirements of today's knowledge ecosystem and charts a course for the future of special collections. Expanding upon the proceedings of the National Colloquium on Special Collections organized by the Kelvin Smith Library of Case Western Reserve University in October 2014, this timely resource for special collections librarians, administrators, academics, and rare book dealers and collectors recounts the factors that governed the growth and use of special collections in the past; explores ways to build 21st-century special collections that are accessible globally, and how to provide the expertise and services necessary to support collection use; gives advice on developing and maintaining strong relationships between libraries and collectors, with special attention paid to the importance of donor relations; provides critical information on how libraries and their institutions' faculty can best collaborate to ensure students and other researchers are aware of the resources available to them; showcases proactive, forward-thinking approaches to applying digital scholarship techniques to special collections materials; looks at how the changes in the way authors work-from analog to digital-increases the importance of archives in preserving the aspects of humanity that elevate us; and examines sustainable and scalable approaches to promoting the use of special collections in the digital age, including the roles of social media and crowdsourcing to bring collections directly to the user. More than simply a guide to collection management, this book details myriad ways to forge the future of special collections, ensuring that these scholarly treasures advance knowledge for years to come. Technological advances and the rise of collaborative, interdisciplinary approaches have changed the practice of research. The 21st century researcher not only faces the challenge of managing increasingly complex datasets, but also new data sharing requirements from funders and journals. Success in today's research enterprise requires an understanding of how to work effectively with data, yet most researchers have never had any formal training in data management. Libraries have begun developing services and programs to help researchers meet the demands of the data-driven research enterprise, giving librarians exciting new opportunities to use their expertise and skills. The Medical Library Association Guide to Data Management for Librarians highlights the many ways that librarians are addressing researchers' changing needs at a variety of institutions, including academic, hospital, and government libraries. Each chapter ends with "pearls of wisdom," a bulleted list of 5-10 takeaway messages from the chapter that will help readers quickly put the ideas from the chapter into practice. From theoretical foundations to practical applications, this book provides a background for librarians who are new to data management as well as new ideas and approaches for experienced data librarians. It is impossible to imagine the future of academic libraries without an extensive consideration of open access the removal of price and permission barriers from scholarly research online. As textbook and journal subscription prices continue to rise, improvements in technology make online dissemination of scholarship less expensive, and faculty recognize the practical and philosophical appeal of making their work available to wider audiences. As a consequences, libraries have begun to consider a wide variety of open access flavors and business models. These new possibilities have significant impact on both library services and collection policies, and the call for new skills within library staffing. Volume 9 of the series Creating the 21st-Century Academic Library is the first of two addressing the topic of open access in academic libraries and focuses on policy and infrastructure for libraries that wish to provide leadership on their campus in the transition to more open forms of scholarship. Chapters in the book discuss how to make the case for open access on campus, as well as the political and policy implications of libraries that themselves want to become publishing entities. Infrastructure issues are also addressed including metadata standards and research management services. Also considered here is how interlibrary loan, preservation and the library s role in providing textbooks, support the concept of open access. It is hoped that this volume, and the series in general, will be a valuable and exciting addition to the discussions and planning surrounding the future directions, services, and careers in the 21st-century academic library." In recent years, levies, grants, and other traditional sources of library funding have stagnated or even been scaled back. But as they've already done in other areas, libraries can take an innovative, proactive approach to funding. Change creates opportunities, and the ability to see and exploit opportunities is what creates new revenue streams, which can help maintain and enhance library services. Offering step-by-step guidance, in this book Rossman shares more than 40 revenue-generating methods to bolster the library's bottom line. Libraries can use this book's to-the-point guidance to quickly develop plans that support financial stability and better library service. Newly revised and refreshed, this invaluable how-to manual will teach you the skills and strategies crucial for finding, applying for, and winning grants. Whether you're starting from scratch and don't know where to begin, or you're an experienced grant writer looking to tap into new funding sources, this resource offers a proven, easy-to-understand process for grant success. Loaded with a wide variety of forms, worksheets, and checklists to help you stay organized. Written by two librarians who are experts in grantsmanship, this all-in-one toolkit for winning grants is a must-have for library directors, grant writers, board members, consultants, and anyone else involved in planning library programs and services. The Manual of Strategic Planning for Cultural Organizations adopts a hollistic approach to the creative world of cultural institutions. By encompassing museums, art galleries, gardens, zoos, science centers, historic sites, cultural centers, festivals, and performing arts, this book responds to the reality that boundaries are being blurred among institutional types--with many gardens incorporating exhibitions, many museums part of multidisciplinary cultural centers and festivals.. As cultural leaders transform the arts in the twenty-first century, this "whole career" manual will prepare readers for every stage. Three key areas covered are: Leadership change. This chapter explains the role of strategic planning when an institution is going through the process of hiring a new director. A question we are frequently asked is "Should the strategic plan precede the search process or should it wait until the new director takes up the position?" Institutional change. Increasingly, cultural organizations are going through major change: from public-sector agencies to nonprofit corporations; from private ownership to non-profit status; from nonprofit status to a foundation, and many other variations. This book addresses the role of strategic planning during these transitions. Staff empowerment. This manual addresses the opportunities for staff at all levelsto grow by participating in strategic planning. This edition focuses on how to engage and empower staff. A Guide for Museums, Performing Arts, Science Centers, Public Gardens, Heritage Sites, Libraries, Archives, and Zoos is a game-changing book with broad reach into the cultural sector, while still serving the museum community. In the last decade library collections have rapidly evolved from a predominance of print books and journals to an ever growing mix of digital and print resources. Library patrons are predominately served by support staff that is expected to know how to help patrons select and use digital resources. Yet most library support staff (LSS) has not had training to become proficient in finding, using, and instructing others in the abundance of the digital resources of websites, databases, e-texts, digital libraries and their related technologies. Library Technology and Digital Resources: An Introduction for Support Staff is both a text for professors who teach in library support staff programs and an introductory reference manual for support staff who work in libraries. This book will guide the LSS to be able to: -Distinguish key features and enhancements found among vendors and providers of digital libraries, digital collections, databases, and e-texts; -Plan, budget, fund and write grants for digital resources; -Understand the complexity and options of licensing and usage agreements for digital resources; -Know copyright permissions and acceptable use guidelines for digital resources. -Understand the basic technologies that support library digital resources including network structures, software applications, and protocols; -Distinguish between directories and search engines as they relate to digital resources as well as be able to employ advance search skills effectively; -Explore the resources of global, national, and state digital libraries and their collections; -Use government databases and other digitized systems and information sources; -Find exemplary digital resources though other agencies such as museums, university collections and other sources that librarians can share with patrons. -Create local digital resources of primary and historical materials and artifacts with metadata and cataloging for searchable access. -Interpret meaning from library digital resources using visual literacy skills. -Promote library digital resources through a variety of means including social media and online options. Libraries organize information and data is information, so it is natural that librarians should help people who need to find, organize, use, or store data. Organizations need evidence for decision making; data provides that evidence. Inventors and creators build upon data collected by others. All around us, people need data. Librarians can help increase the relevance of their library to the research and education mission of their institution by learning more about data and how to manage it. Data Management will guide readers through: 1.Understanding data management basics and best practices. 2.Using the reference interview to help with data management 3.Writing data management plans for grants. 4.Starting and growing a data management service. 5.Finding collaborators inside and outside the library. 6.Collecting and using data in different disciplines. Games can seem to do the impossible: reach patrons and drive traffic to projects and services. But how can libraries use gamification and game elements to improve instruction and outreach, or to encourage the use of particular areas and services? In this guide, readers will learn about how to structure game activities in order to best reach their patrons. Chapters devoted to topics such as personalization, goal setting, working with partners, games in instruction, and assessment illustrate some of the many ways games can have an impact in libraries. Everything in this book is presented from a practical point of view - email templates, real-life examples, and scenarios are included. Games have a lot of potential for use in many different library services, and this book will help you decide how they might work best for you. From the first seeds of a project's beginning to its eventual maturation, this book will help you develop, implement, and evaluate game-style projects at your library. Designed for experienced librarians, librarians new to the profession, and library school students, Online Teaching and Learning: A Practical Guide for Librarians provides a comprehensive framework that encompasses all aspects of planning, designing, creating, implementing, and assessing online learning for all types of libraries, including public, academic, special, and K-12. It also provides a valuable guide for teachers, administrators, and other educators. Online Teaching and Learning: A Practical Guide for Librarians features three main sections: -Section I: Theory into Practice forms the basis in theory of learning that ultimately influences practice. It includes definition, importance in today's society, benefits and challenges, and categories and types of online learning with examples to illustrate each. -Section II: Creating Online Instruction explores how to create an online course--describing components and stepping through the process using a model on the topic of information literacy. Design and instructional tips for creating other types of online instruction are also given. -Section III: Practical Applications provides examples of different types of online instruction and materials in all types of libraries. Then, step-by-step detail explains how librarians can create this type of instruction and/or learning materials on their own. Included are worksheets, handouts, and exercises. Online Teaching and Learning: A Practical Guide for Librarians puts it all together to provide what the library must consider as it prepares for this new challenge and opportunity. It provides a comprehensive guide instructing online programs how to employ library services as part of their program. It is also designed to instruct librarians to incorporate the skills necessary to build a virtual library environment and teach the skills required to meet the needs of online learners. As the educational landscape changes with blended and online learning taking center stage, new and established librarians need a guide to inform them of skills they will need and show them how to create the resources for their new online audience. The written word is our primary tool for communication - with colleagues, administrators, stakeholders, and users. Poor use of words can lead to misunderstandings and inefficiencies. Writing effectively will help you be a stronger colleague, manager, and librarian. In this book, you will learn how to: -Define your audience and your primary messages -Simplify your writing so that it is succinct and understandable -Structure your written content so that it is most usable and accessible to your audience -Approach different forms of writing in a way that is most effective to getting your message across -Establish a voice and tone that reflects the identity of your organization and yourself as a professional The book covers writing for both print and Web-based publications and is aimed at all types of libraries. Reference and Information Services, if it may still be referred to by this term, is an evolving outreach service in libraries. This is not only due to Google and the Internet, but also other technological advances afford users online access to a plethora of content, free and proprietary. This evolution has also caused a shift in the theories and practices (especially, core functions and values) of reference and information services as library schools seek greater alignment with practitioners and libraries on the forefront of these changes. As academics and practitioners work together to educate library students on the kinds of changes happening in reference and information services, they are rethinking their curriculum and assignments to incorporate real-world challenges adaptive to user needs. Likewise, libraries may work through their regional library consortia to plan professional development workshops or training sessions to teach new skills and methods of approach required for such changing services. Here s a tool for library school instructors, library students, professional development instructors, and current librarians poised to change, which specifically addresses the pedagogy of reference and information services in flux. It will help answer questions such as: .How may we better educate a new and current generation of reference and information service professionals, given the challenges they will likely encounter? .What kinds of assignments could be devised to better promote active learning in a transformative field like reference and information services? .What new approaches or theories could be applied to assist library professionals in meeting the informational needs of users?" Libraries are charged with fostering new skills and capabilities, a challenging task in an era of rapid technological change. Developing new ways of teaching and learning--within budget and time constraints--is the key to keeping up-to-date. Written by librarians, this collection of new essays describes an array of technology outreach and instruction programs--from the theoretical to the practical--for public, academic and school libraries, based on case studies and discussions of methodology. Content includes out of the box lessons, outreach successes and technology instruction programs applicable to patrons and staff at public, academic and school libraries. Planning and managing a self-contained digitization project is one thing, but how do you transition to a digital library program? Or better yet, how do you start a program from scratch? In this book Purcell, a well-respected expert in both archives and digital libraries, combines theory and best practices with practical application, showing how to approach digital projects as an ongoing effort. He not only guides librarians and archivists in transitioning from project-level initiatives to a sustainable program but also provides clear step-by-step instructions for building a digital library program from the bottom up, even for organizations with limited staff. Approachable and easy to follow, this book traces the historical growth of digital libraries and the importance of those digital foundations; summarizes current technological challenges that affect the planning of digital libraries, and how librarians and archivists are adapting to the changing information landscape; uses examples to lay out the core priorities of leading successful digital programs; covers the essentials of getting started, from vision and mission building to identifying resources and partnerships; emphasizes the importance of digitizing original unique materials found in library and archives collections, and suggests approaches to the selection process; addresses metadata and key technical standards; discusses management and daily operations, including assessment, enhancement, sustainability, and long-term preservation planning; provides guidance for marketing, promotion, and outreach, plus how to take into account such considerations as access points, intended audiences, and educational and instructional components; and includes exercises designed to help readers define their own digital projects and create a real-world digital program plan. Equally valuable for LIS students just learning about the digital landscape, information professionals taking their first steps to create digital content, and organizations who already have well-established digital credentials, Purcell's book outlines methods applicable and scalable to many different types and sizes of libraries and archives. In a world of users that routinely click "I Agree" buttons, librarians may be the lone voice raising an alert to the privacy, use, and ownership issues arising in connection with the design and implementation of digital rights management (DRM) technologies. DRM reflects the efforts of copyright owners to prevent the illegal distribution of copyrighted material - an admirable goal on its face. A common misunderstanding is that DRM is copyright law. It is not. Rather it is a method of preventing copyright infringement; however, if unchecked, DRM has the potential to violate privacy, limit ownership rights, and undermine the delicate balance of rights and policies established by our current system of copyright. All three of these arenas are critical for both librarians and their users. Reflecting the shift from ownership to access, libraries are increasingly providing access to rights-protected digital content. Libraries strive to provide access to rights-protected content in a manner that protects both the content creator and the privacy of the user. DRM encompasses a variety of technologies and strategies utilized by content owners and managers to limit access to and the use of rights-protected content. Librarians need to understand DRM to effectively enable users to access and use rights-protected digital content while at the same time protecting the privacy of the user. Designed to address the practical operational and planning issues related to DRM, this guide explores the critical issues and challenges faced by librarians. After reading it, librarians will better understand: -the digital content rights protection scheme; -the various DRM technologies and how they are used; -how to use authentication and authorization standards, strategies, and technologies; and, -the privacy and security issues related to DRM. Edited by two librarians who also hold law degrees, this is a best practices guide for front-line librarians on how to best respond to the impact of DRM schemes on collection development, staffing, budget, service, and other library concerns. The prospect of a new automation system can be daunting. When do the benefits of moving to something new surpass the deficits of keeping the status quo? Can the products on the market deliver what libraries need to survive and prosper? Are those based on open source more flexible than proprietary systems? What about those deployed in the cloud? These and dozens more questions arise when libraries enter a selection process. Knowing the options is key to arriving at the best answers for your own organization. Marshall Breeding, who has followed the ins and outs of library technology for more than 30 years, gathers together a roster of fellow experts in the field to offer new practioners, library decision makers, and budgeting staff a comprehensive survey of what's out there. Providing substance beyond the buzzwords and hype, this guide quickly brings readers up to speed while providing practical advice on such topics as RFPs: what they are, how to write them and tips for getting bids; standards, interoperability, and trends in resource sharing; distinguishing between infrastructure-as-service, software-as-service, and platform-as-service when it comes to cloud computing; what you need to know to start planning for cloud computing; how library service platforms differ from the traditional ILS; and factors to consider when comparing e-book platforms Armed with this book's clear-sighted perspective, libraries will be empowered to make informed and responsible decisions concerning their technology infrastructure. Advancements in technology are impacting many businesses and institutions, including libraries. As such, it is increasingly imperative to research purchasing methods to boost cost-effectiveness and efficiency. Library Technology Funding, Planning, and Deployment is an authoritative reference source for the latest research on the best methods of the purchase and implementation of various technology systems by libraries. Featuring extensive coverage across a range of relevant perspectives and topics, such as library systems management, Open Source software, and budget constraints, this book is ideally designed for academicians, researchers, practitioners and librarians seeking current research on library purchase and utilization of technology. The ever expanding usage of mobile technologies has dramatically changed how we access information and how we as a society expect to access information. With mobile technologies becoming available to an increasing majority of the population, users are constantly connected to information. The rapid expansion of mobile technology has had a profound impact on many different sectors, industries, and institutions, among those that have been affected are libraries. With more users expecting access to information and resources in a mobile optimized format, libraries have had to adapt to meet the needs of users. This has entailed evaluating various library services and resources to determine how to best meet the needs of mobile users. Additionally, mobile technology has changed the way that websites are designed, and has led to an increasing popular type of web design know as responsive web design (RWD). This enables web developers to design websites with one code base that are optimized for a wide range of devices from desktop computers to smartphones. Libraries must keep their mobile services current or risk becoming obsolete. Based on research, examples, and experience using mobile technology, this book will include topics such as: .The impact of mobile technology .Mobile technology and the Digital Divide .Implications for library staff and vendors .Responsive Web Design .Wearable technology in library services Mobile Technologies in Libraries: A LITA Guide is written for library staff interested in how mobile technologies have changed the way we access, and expect to access, information, as well as how libraries can incorporate and adapt to mobile technology." Most library disaster plans focus on response and recovery from collection and facilities disasters, such as fire and floods. But because technology is becoming ever more integral to libraries' role in their communities, any interruption in service and resources is a serious matter. A disaster's effect on internet and social media sites, electronic resources, digital collections, and staff and public infrastructure of PCs, tablets, laptops and other peripherals requires special consideration. Featuring contributions from librarians who offer hard-won advice gained from personal experience, this compendium leads readers through a step-by-step process of creating a library technology disaster response and recovery plan. This LITA guide Outlines the three phases of technology disaster response, with examples of planning and implementation strategies from several different libraries Describes how to conduct an inventory and risk assessment Provides detailed case studies of recent large-scale technology disasters in libraries and documents how lessons learned have helped to improve technology disaster planning Offers an in-depth look at future trends in cloud computing, mapping out the new field of disaster mitigation, response, and recovery planning Includes useful resources such as checklists, templates, and a sample communications plan Though libraries can never know when or how disaster may strike, with the help of this guide they'll be able to craft a response and recovery plan to weather the storm and get library technology back online as quickly as possible.